The small elephants are made of solid oak and fit like a puzzle piece into the original polished stainless steel form. Like Hans Wegner, Peter Karpf, and Jørgen Gammelgaard, Jørgen Møller is another talented artist who worked for Arne Jacobsen early in his career. 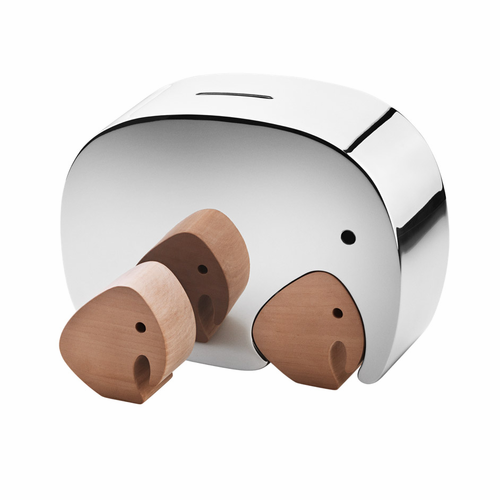 And like many of his fellow Danish designers, Møller is an architect. He opened his own office in 1967 and has had work published in Living Architecture, Arkitectur Denmark, Graphis, and Mobilia. Americans are most familiar with Møller's designs for Georg Jensen Silversmiths. He has created watches, utensils, and thermometers in stainless steel, anodized aluminum and other metals and synthetic materials for the company that originally manufactured silver products only. 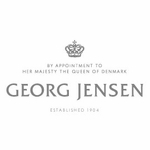 Georg Jensen currently carries Møller's Complet�a kitchen set including salad bowl, creamer, sugar bowl, salt and pepper mill�and his 345 Watch. He also designed an oil lamp for the Israel Museum and the molded wood Taburet M Stacking Stool. His work in is included in the collection of New York's Museum of Modern Art.